The issue of racism in football is the topic of discussion at an open forum being held at the University of Chester as part of its Diversity Festival 2017. Kick It Out is football’s equality and inclusion organisation, working to tackle all forms of discrimination in the game, including racism. The charity is joining forces with the University and its Forum for Research into Equality and Diversity (FRED) to host a panel discussion on Tuesday February 28 on the views and experiences of racism in football. Steve Smithies, who works for The Football Association as a Regional Coach Mentor, where he is responsible for meeting the needs of BAME (Black, Asian and Minority Ethnic) coaches. Steve is also the Youth Team Manager at Nantwich Town FC. Sean Cottrell, who is the CEO and founder of Law In Sport, works with lawyers and law firms to create targeted and accessible legal content, develop marketing strategies and provide training on digital media. Hayley Bennett, who is shaping the future of equality in her role as Education Officer at Kick It Out. Hayley’s role involves coordinating the organisation’s message to young people, as well as supporting Kick It Out to develop its outreach beyond football. Sophie Cowell, who is a member of Kick It Out’s ASPIRE group. Sophie is a researcher for FRED at the University, and is studying for a PhD at the University of Chester Law School. Her PhD considers the positive action to increase the representation of Black, Asian and Minority Ethnic football managers and coaches. The free event takes place on Tuesday February 28 between 5.15pm and 7.15pm at the Westminster Building (Room 017) on the University’s Parkgate Road Campus and all are welcome to attend. Booking is essential and can be done by visiting the event page at: www.chester.ac.uk/about/diversity-and-equality/diversity-festival. 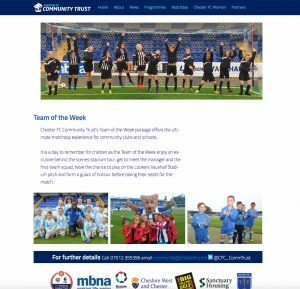 Chester FC Community Trust has launched a new website to make it easier for people to get involved and promote the organisation’s community activities. The site community.chesterfc.com will include the latest news, information on the Trust’s initiatives under the four themes of coaching, education, health and inclusion, matchday experience opportunities and dedicated coverage of the Chester FC Women’s team. Online flyers and booking will make it easier than ever for people to engage with the Trust and access its range of programmes, including Mini Kickers, Soccer Schools and Walking Football. Visitors to the site can also learn about the Trust’s aims and objectives, the organisation’s work within schools and its relationships with valued partners, including MBNA, the National League Trust, the Cheshire Football Association and Big Yellow Self Storage. The site has been designed by Mike Day, who is a director of both the Club and the Trust. 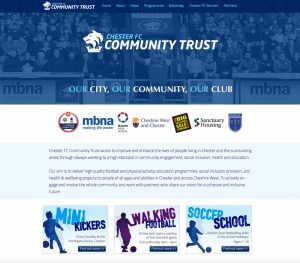 Jim Green, chief executive of Chester FC Community Trust, said: “The launch of the new website is an important step for the Trust and means we can more effectively highlight our work as well as making it easier for people to engage with us. “Mike Day has worked incredibly hard to bring the website to life and the end result is fantastic. To be able to have information about all of our activities in one place means supporters and the wider community can keep up to date with our work and benefit from the programmes that appeal to them. The Cheshire FA is delivering a subsidised FA Level One coaching course aimed at getting more females into coaching. No experience of coaching is needed prior to the course. There a limited amount of places and they will be given on a first come first served basis, so those interested are advised to book early to avoid disappointment. Candidates need to be aged 16 and above to enrol on the course. For further information please contact the Cheshire FA coach education department on 01606 871166 or click here to book a place. 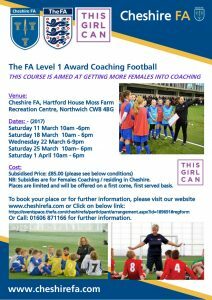 An FA Level Two course aimed at females will also be starting in April in Cheshire. Candidates must have FA Level One certificate. Please click here for further details. There is a free event taking place in Manchester to support and develop female coaches involved in football in the North West, no matter where they are on their coaching journey. The event will take place at the City Academy from 6.30pm to 9pm on Tuesday, March 21st. Attendees will be able to watch sessions put on by Manchester City LFC coaches across different age groups and find out more about the FA Girls Talent programme. For further information and to book a place on the workshop email stephanie.knott@cheshirefa.com.